Reece White goes undefeated, four others only lose one match in tourney at Expo Center. The Madras wrestling program took part in the wrestling heaven known as the Oregon Classic last weekend, and managed some strong individual success. Freshman Reece White won all six of his classic matches. Junior Orlando Torres wrestled in his first tournament since returning from injury at the beginning of the year and won three of his four matches, just as Malachai Alire did. Victor Torres and Kody Zemke both won two out of their three matches for the White Buffalos. As a team, the White Buffalos faced Baker in their first match of tournament, but lost to the Bulldogs 58-17. Against Baker, Zemke (220) pinned Lucien Yervasi in 1:41 and freshman White (170) pinned Gauge Bloomer in 2:23. Alire (120) was able to beat Trevor Tidel in a 16-0 technical fall, but no other Buffalo won a match. Madras was barely edged out by Molalla in a 39-36 loss. Alire pinned his Molalla opponent, Alec Lowry, in 1 minute, 47 seconds and White pinned Caleb Taylor in 4:40. Osmar Piza won by fall in 1:10, beating Matthew Zirsel. Elijah McCourtney won a 15-10 decision over Christian Roberts and Orlando Torres beat Molalla's Dylan Winn, in a 7-4 decision. Leander Smith and David Sumner both won by forfeit for Madras, but the Buffs fell short 39-36 to the Indians. 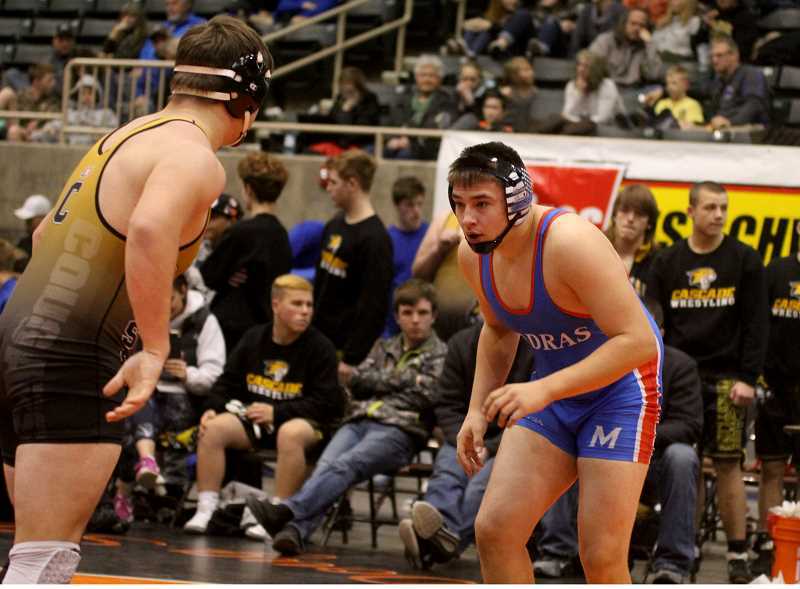 Madras was only able to win four matches in their next dual against Cascade, but the wrestlers who did win were able to do it in a dominant fashion. Victor Torres and Colin Switzler both won by fall, while Alire won a 9-1 major decision and White a 14-1 major decision. The Buffs fell short 60-24 to Hidden Valley in their last match of Friday. Switzler, Victor Torres, Orlando Torres, and White all pinned their Hidden Valley challengers and were able to give the Buffs 24 teams points. In a bonus match, the White Buffalos lost to McLoughlin 42-33. Orlando Torres, Bailey Dennis, Zemke, McCourtney, all won by fall, while White won a 12-7 decision and Leander Smith won by forfeit. The White Buffalos pulled out a 30-28 victory over Marshfield in another bonus match of the day. McCourtney and White both won by fall, while Smith, Piza and Sumner won by forfeit. The Buffalos travel to Cottage Grove for a tournament Friday and Saturday, Jan. 25-26.